Sept 2017 ~ Double CD set!! 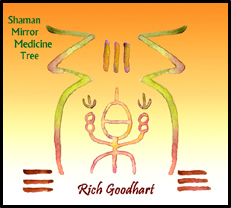 Progressive world rhythm Shamanic Sound Medicine music! Details here, including audio samples & ordering. David Duhig of Jade Warrior and Athena Burke. 2010 ~ Double CD set!! 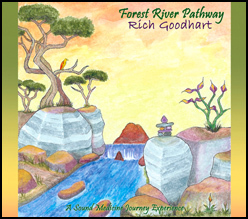 A progressive world rhythm shamanic journey, with occasional soul affirmative chants & spirit cleansing healing sound meditations. Jon Anderson of YES, Jim Ballard & David Macejka. 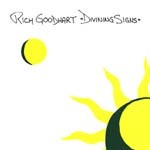 "The music of Rich Goodhart transports me, especially while I am painting. to tap inner knowings...a wisdom only accessed through the senses. I know that through this music." Daevid Allen ~ glissando guitars on Entering the Circle and Weaving Luminous Strands. Jon Anderson ~ all vocals and lyrics on Good Love Coming. Jim Ballard ~ all vocals on Word from the Elders. David Macejka ~ frame drum on Between Earth and Sky and Earth Medicine Rhythm. John Ragusa ~ flute, drum and vocals on "Moon Ra". Kris Renta ~ vocals on Moon Ra. Raji Nevin ~ vocals on Moon Ra. tambourine, bells, hand claps, guiro, keyboards, drones. songs of earth mystery musings. tambourine, bells. Chant, chorus and lead vocals. Joanne Shenandoah - Lead and Chant vocals on "It's Always There". Joanne Shenandoah and Bansuri Flute master Steve Gorn. Journey with. My deepest compliments!" "Well, it came, I listened, it conquered, captured, enveloped, convinced. the Great Song, the Great Gift. Blessings." & it keeps playing itself!! Thanks for including me. Progressive world beat art songs. 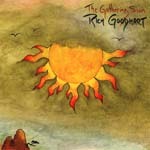 The Gathering Sun is the most dynamically arranged and musically evolved of Rich�s work. 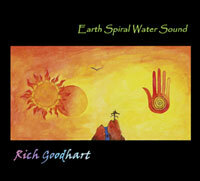 Combines some of the best elements of world music, progressive rock and eco-spiritual poetry. 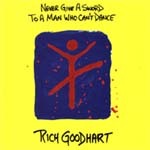 "Never Give A Sword To A Man Who Can�t Dance"
Progressive world beat instrumentals with wordless vocals. RG � Dousn�goni, berimbau, African drums (sogo, kidi, ashiko), frame drums (tar, riq, bendir), sanza, keyboards, doumbek, talking drum, log drum, clay pot, percussion, conga, bamboo jaw harps, tabla. "This is music with a true sense of adventure, with plenty of backbone and vibrant heart." roto-toms, percussion, conga, bass, pan pipes. 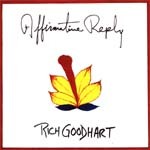 JOHN RAGUSA � Flute and trumpet on "Blue Bertolli"
RAY JUNG � Bass and Chapman stick on "Blue Bertolli"
exotic, richly textured web Goodhart weaves with his panoply of ethnic instruments. "Planet Drum", Dead Can Dance, Enigma and Ottmar Liebert. World beat instrumental w/ New Age leanings. STEVEN KRASKOW � Bass on "What Do Your Eyes See?" TIM DINOVO � Drums on " Won�t You Join The Dance?" Warning: Computer programmed, sampled performances are not a part of the music on these records. All parts were played by hand.